Business cards should be memorable right? Well guess what, seed paper business cards are proven to leave a lasting impression. The paper comes in a variety of colors and is embedded with a mix of beautiful wildflower seeds. The unique texture of the paper will immediately catch people’s attention and engage them right away. When the card is covered with soil, the paper will safely break down and release nutrients into the soil while the seeds germinate. In no time at all, the flowers will grow and your customers will have flowers to remind them of your brand. Our seed paper is completely biodegradable and recyclable so when planted, it will safelybreakdown. Seed paper can be used in the same way as regular paper, but due to the variations in the surface of the paper, be aware that each card will be unique even when using the same file and the same printing equipment. The random placement of seeds gives the paper a really great textural feel, but this also means the paper may not maintain crisp printing or impression. The paper still delivers stunning results, but there will not be the consistency between each card that you would achieve with a more traditional stock. Folks I have worked with on creating seed paper business cards are very pleased with the results and tell me that they make a great conversation piece because they are so unique. While seed paper is different from regular paper in many ways, it is still similar enough that it can be used to create stunning business cards. We offer full-color one-sided printing on 2” x 3.5” stock so you can customize your cards with your logo and inks to really make your seed paper business cards pop. The embedded seeds give the paper some eco cache, which will help drive home your company’s stance on environmental issues in an inventive and original way. 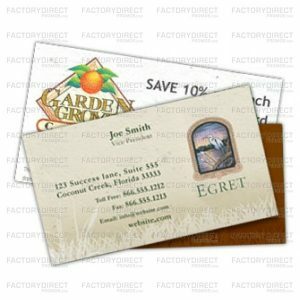 Since the cards are intended to be planted, in order for the seeds to germinate, your customer will lose all of your contact information, so make sure to include a web address, contact info or a hash tag, so people will know how to get in touch with you after they plant your seed paper business card. Additionally, I always recommend that when handing out seed paper business cards, you follow up with a connection request on LinkedIn and a phone call and hey, maybe even a request for a round of golf. Seed paper business cards are a conversation starter so be prepared to answer questions about the paper and explain how to plant the seeds embedded in the paper. To learn more or to get a quote head here. As always, we are at the ready to answer any questions you may have about the paper, or the design and production process. Have a great, green week and thank you for stopping by! Previous Previous post: Is Zero Waste Really Attainable at Trade Shows?